Telseris is an up-and-coming past-tech roleplay region, founded by a bunch of duders with too much free time on their hands. Visit us on IRC at #Telseris@Esper! Telseris - Because God wills it. Embassies: Paradoxia, Borealias, Astyria, and Greater Dienstad. Tags: Minuscule, Password, Past Tech, and Role Player. As a region, Telseris is ranked 2,639th in the world for Most Pro-Market. 77 days ago : The Easter Egg Stealer of Tarrenor of the region The New North West proposed constructing embassies. 83 days ago : The Confederacy of Nepi Szovetseg ceased to exist. 87 days ago : The Ancient Empire of Telseris Founder updated the World Factbook entry. 172 days ago : The Ancient Empire of Telseris Founder arrived from Balder. 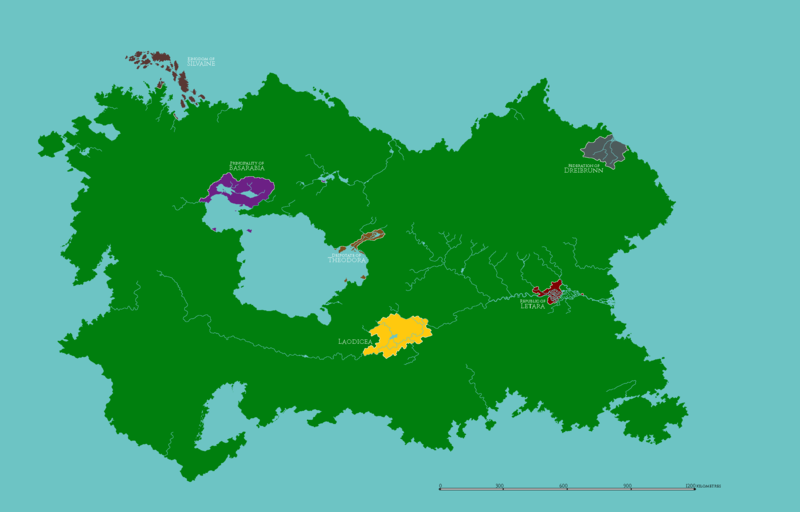 172 days ago : The Paludal Republic of Letara arrived from Balder. 178 days ago : The Paludal Republic of Letara ceased to exist. 178 days ago : Regional Founder The Ancient Empire of Telseris Founder ceased to exist. 230 days ago : The Football Playing Confederacy of RBBF of the region SECFanatics proposed constructing embassies. 295 days ago : Basarabija ceased to exist. 305 days ago : The Ancient Empire of Telseris Founder arrived from Lazarus. The lore thread is up! Updated the map with a scalebar! 1 pixel = 1.5 kilometres, if you're wondering. Also, welcome, Nepi Szovetseg! Let me know where to stick you on the map, on the RMB or by TGing me (preferably at Maltropia 'cause I actually check that on the regular); or wherever else I might happen to be.